Earth's Best Organic is on a mission to provide "better for baby" products with the freshest, purest ingredients, so parents can nurture their baby's health with the utmost confidence. 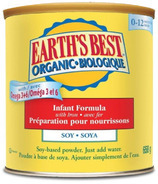 Here you can find Earth's Best Organic diapers, baby food, and baby formula. 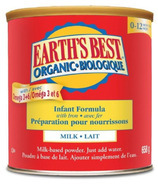 Earth's Best Organic offers organically certified foods and formulas that also contain non GMO ingredients. Their diapers are chlorine free, latex free, dye free and perfume free so you can feel better about the diapers your little one wears day in and day out. With Earth's Best Organic products, each ingredient is tested for pesticides and potentially harmful residues and no product is released until the quality assurance department approves laboratory results. Choose only the best with Earth's Best Organic. Try some popular Earth's Best Organic products like Earth's Best Chlorine Free Diapers, Infant Formula With Iron with Milk Based or Soy Based options or Sesame Street Yummy Tummy Instant Oatmeal.